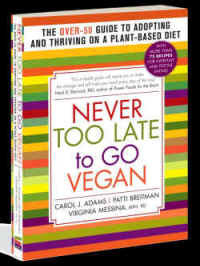 Available through Amazon, Barnes & Noble, Workman, BAM, Powell's Books...From Never Too Late to Go Vegan website: If your local independent bookstore carries Never Too Late to Go Vegan, we would encourage you to support them. Use IndieBound to help you locate your closest independent bookstore. "You can't teach the old maestro a new tune." "You cannot teach old dogs new tricks." them that it is never to late to go vegan. eating, Harvey and Marilyn Diamond's "Fit for Life". including a landmark book on soy. today's vegans and non-vegans with her spiritual wisdom. step back. Three steps forward, two steps back. It has not been an easy journey. I have a theory. 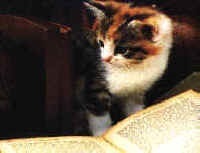 after the traumatic event to prolong their lives. bone disease, and heart disease which plague us. We have come a long way without a detailed road map. Edenic garden of good health. "I was a terrible cook before I became a vegan." between eating a dead cow and a dead pony?" my plate and the lives (and deaths) of animals." our odds of getting sick." Patti: "I attended a monthly potluck dinner for vegetarians..."
Carol: "The realization that tofu could become a cheese substitute..."
their own experiences regarding the lifestyle change. These presentations are fun to read, and informative. to their treatise on: Why and How We Age. On PAGES 80-81, there is a valuable chart: Healthy Plant Foods: The Best of the Best. This chart alone is worth the price of admission (he Purchase of this book!). they offer 5 Tips for Affirming Family Traditions. for last. The food. The recipes. The menu. On Page 205, you are invited: Let's Eat! for extreme Pavlovian conditioned responses.